Essential tremors are often referred to as “benign” because they are not indicative of any neurodegenerative diseases (2), but my grandmother’s tremor has been far from benign for her lifestyle. She retired from her job as town secretary because she was embarrassed by her increasingly jagged signature. Since then, her increasing tremor has forced her to give up baking her famous cookies and sewing doll clothes for her granddaughters. When she goes out to eat, she chooses items that don’t require utensils, since the food will fall off the fork or spoon before reaching her mouth. We don’t realize how crucial a relatively steady hand is for almost everything we do in life until we don’t have one. A few months ago, at 90 years old, my grandmother decided she was sick of shaking all the time. It had started to affect her balance and make her less stable on her feet. A few months later, she was in the operating room undergoing deep brain stimulation (DBS). DBS is a surgical procedure used to treat a number of conditions, including Parkinson’s, tremor disorders, dystonia, and Tourette’s syndrome (5). It has also proven effective for treatment-resistant depression (8) and epilepsy (9). When DBS is used to treat ET, an electrode is placed in the thalamic ventralis intermedius nucleus (1), and a lead is implanted to connect the electrode to a neurostimulator/implantable pulse generator (IPG) implanted below the clavicle. The ventral intermediate nucleus projects to the motor cortex, so it’s highly involved in the types of movements that ET patients struggle most with (6). The IPG contains a battery and sends electrical pulses to the electrode, which in turn reduces the tremor. The IPG can be controlled with an external remote control, which allows the doctor to program the doctor to program the pulse generator or the patient to make minor adjustments at home (7). Some patients are even instructed to turn the IPG off when sleeping. An understanding of the mechanisms through which DBS works is still murky (1). Researchers do know that the electrical impulses block the tremor-inducing nerve signals, but exactly how that is done is still being investigated (5). The process of thalamotomy is used to destroy parts of a dysfunctional thalamus (3). Although DBS uses techniques from thalamotomy, it disrupts the activity of the thalamus without causing destruction. For this reason, DBS is associated with fewer side effects and is reversible. All studies of DBS for essential tremor have found significant reductions in tremor, but information reporting changes in the quality of life for patients after surgery is lacking (1). I can only speak for my grandmother, but if the enthusiasm with which she assures me she has been practicing writing her name is any indicator for other recipients of DBS, the procedure has exciting potential for bringing physical stability back into many lives. (3) Mental Health and Deep Brain Stimulation. WebMd. (4) Taba, H.A., Wu, S.S., Foote, K.D., Hass, C.J., Fernandez, H.H., Malaty, I.A., Rodriguez, R.L., Dai, Y., Zellman, P.R., Jacobson, C.E., & Okun, M.S. (2010). A closer look at unilateral versus bilateral deep brain stimulation: Results of the National Institutes of Health COMPARE cohort. J. Neurosurg., 114(6), 1224-9. (5) Deep Brain Stimulation. Suburban Hospital, Johns Hopkins Medicine. (6) Ventral intermediate nucleus (TA) of thalamus. MediLexicon. (7) Deep Brain Stimulation. Mayo Clinic. (8) Mayberg, H.S., Lozano, A.M., Voon, V., McNeely, H.E., Seminowicz, D., Hamani, C., Schwalb, J.M., & Kennedy, S.H. (2005). 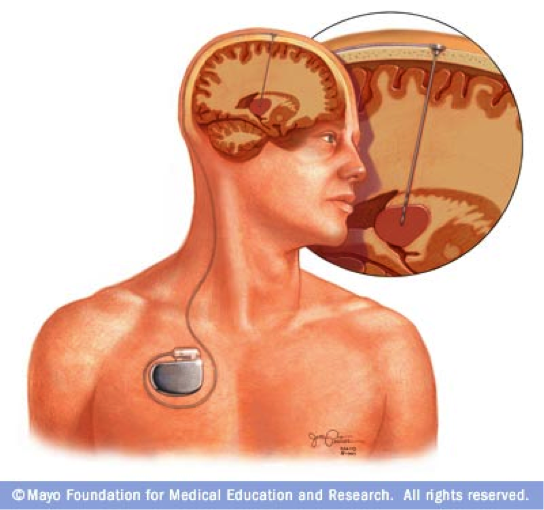 Deep brain stimulation for treatment-resistant depression. Neuron, 45, 651-660. (9) Boon, P., Vonck, K., De Hert, V., Van Dyke, A., Goethals, M., Goossens, L., Van Zandijcke, M., De Smedt, T., Dewaele, E., Achten, R., Wadman, W., Dewaele, F., Caemaert, J., & Van Roost, D. (2007). Deep brain stimulation in patients with temporal lobe epilepsy. Epilepsia, 48(8), 1551-1560. DBS is such an exciting technology, despite our troubling lack of understanding of what it is doing to the brain. My advisor is a pediatric neurologist at CHLA, and some of his patients have begun to receive DBS implants. We are very excited and hopeful for the potential positive results. In these cases, results are never guaranteed and rarely as immediate so your grandmother’s.